It is time once again for another Silhouette Promotion! This time we were given some Silhouette Temporary Tattoo Paper to test out. 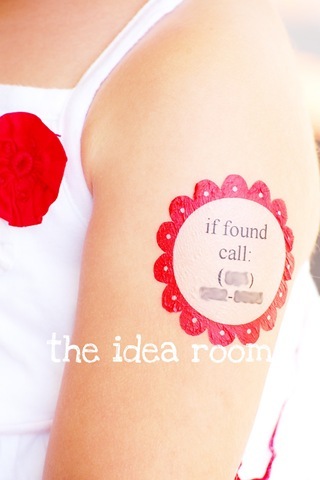 Instead of going with just a regular picture tattoo, I thought it might be fun to make a tattoo that was cute and functional at the same time. Since we spend a bit of time at amusement parks and other touristy attractions in the summer time, I thought it would be nice to have a way to identify my youngest kids just in case they were to get lost. I usually stick a business card with my husband’s cell phone number on it and a note to call the number if someone happens to find my lost child. But the problem with that is that they child may not know or remember to give the stranger the card and it might never be found, despite us practicing it before heading out. This way the information is right there. I also made some that had her name on it along with the phone number. 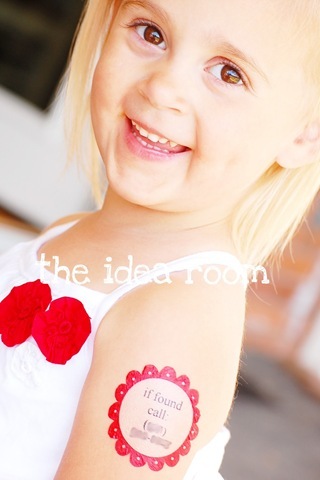 The fun part is that you can totally customize the tattoos with your own personal message. 1. 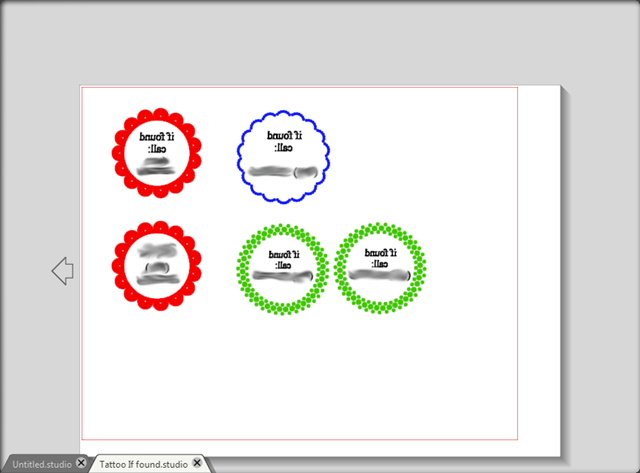 Download your favorite Tattoo shapes and pictures. 2. Upload them to your Silhouette software program on your computer. 3. Add text and modify colors to your liking. 4. When images are how you would like them, make a mirrored image of the shapes and the texts. 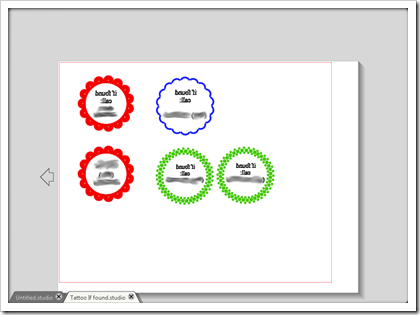 To do this select Object from the top menu bar. And mirror options (I chose mirror image right). 5. 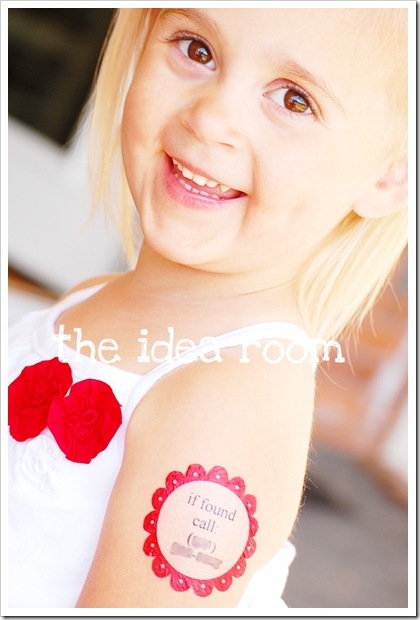 Then print your images onto your tattoo paper (the white one) with your printer. Be sure to select photo paper as your paper and the size 8.5 x 11. 6. Then when it has printed out, take your clear sticky transfer paper (with the green background). 7. Peel off the corner and line it up so that it fits perfectly in alignment with your tattoo paper. Carefully peel away backing and smooth it onto the tattoo paper. Do this carefully and then press it on with your rubber scraper. Then load paper into your Silhouette Machine and cut it. I cut mine at a speed of 3 and a thickness of 25. It will require a double cut to go through both layers. Then simply peel off the plastic layer and place the tattoo on the skin so that you just see the blank backside of the paper. Hold a wet washcloth to the back of the tattoo for a few seconds and the tattoo should easily peel away from the backing and stick to the skin. And guess what? You can even make these without a Silhouette machine if you don’t have one or it is not in the budget right now. 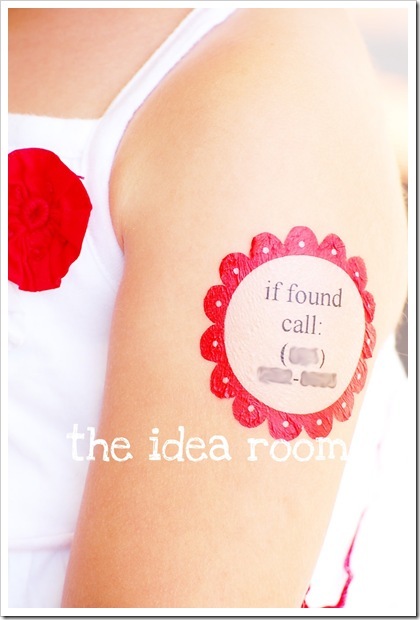 Simply print the tattoos onto the paper and then cut them out the old fashioned way. A little more work and effort, but hey…it works! The promo will run from June 21-29! 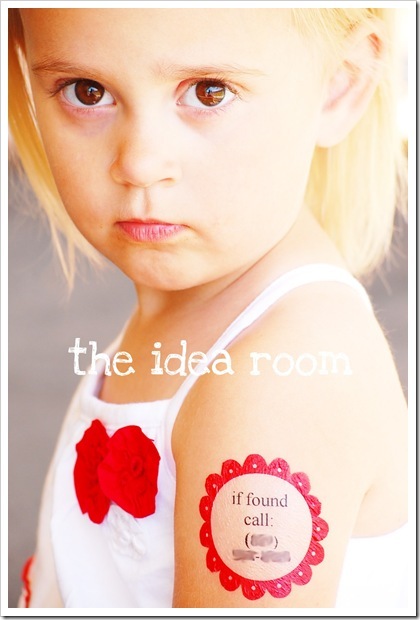 **To get this great offer, you will need to use the code “IDEAROOM” upon checkout. Click the Silhouette button and it will take you directly to Silhouette’s site! And…I guess great minds think alike! I saw my friend Beckie’s, from Infarrantly Creative, sneak peak for her Tattoo tutorial and we both came up with the same ideas! Head on over and check out her version! Super cute I might add! Maybe, if they were wearing sleeves, you could put an arrow pointing up just under the sleeve, but they would have to push the sleeve up to actually see that tattoo. Or you could do the same thing with shorts & have the tattoo on their outer thigh. Just brainstorming…. That is a good idea Tiffany. I don’t like the idea of having my number out there either. I always worry that the child will be too young to let them know it is there or even realize it is there too. So the arrow is a great idea. when i click on the silhouette sd link, the bundle price shows $249, not $199. 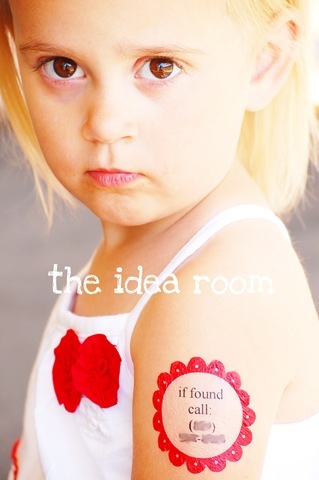 Jennifer–I think the discount will be taken off when you enter the code IDEAROOM upon check out. Perfect tor my G’sonsPEANUT ALLERGY! We always are concerned he wont share the info in Sunday School if a new adult were in there, even though his parents are terrific at getting the word out! GREAT FOR ALLERGIES! I love it. Diana! That is a great idea! Love that! Safety is always a great idea, but I work with children and families regarding safety and anything with a name or phone number visable to the public is a safety no-no. I have four little kiddos myself, we (our office-after consulting with local police, federal investisgators and etc)recommend writing the info on the inside bottom of their shoes with a sharpie-type marker. Stays put, they know where the info is-their name and our info-but no one else knows it is there. Thanks Jennifer! That is good information to know. Thanks for sharing that. Thanks! haha! I think your little cutie could give her a run for the money though! Why do they have to grow up? I love this idea. I have done something similar to your business card idea. With my oldest child it is not a problem for her to remember that she has that card (actually she has most of our numbers memorized), but we pin it inside her skirts or pant legs, just in case she can’t speak for herself (Heaven forbid!). For our toddler we laminate the card with the info in a luggage tag or by covering it with clear packing tape. Then we tape this to the back of his shirt. When we did this during our last trip to Disney World we got so many compliments. It is a great idea, no matter now you put it into practice. Thank you for posting. I tired it, worked well. Although, it left a sticky residue on my childrens bodies after we took it off. Very difficult to get it all off. When it was on they complanned that the tattoo itched. This is a FABULOUS idea!!!!!!!!!!! You rock, Mom!!!!!!!!!!!!!!!! !